You can create printable tests and worksheets from these Grade 8 Circulatory and Immune Systems questions! Select one or more questions using the checkboxes above each question. Then click the add selected questions to a test button before moving to another page. What do red blood cells not do? The heart contracts on its own about 200,000 times a day. oxygen and nutrients to flow out of the blood to the cells. blood to flow in very narrow places. blood to stop flowing if needed. What large blood vessels take oxygenated blood from the heart to the body? What blood vessels take deoxygenated blood to the heart? At which site does oxygen diffuse into the blood? What organ is part of the circulatory system? What purpose do red blood cells serve in the circulatory system? What tiny blood vessels are where the exchange of oxygen and nutrients take place for wastes taken from the cells? What part do valves play in the circulatory system? What is the largest artery? 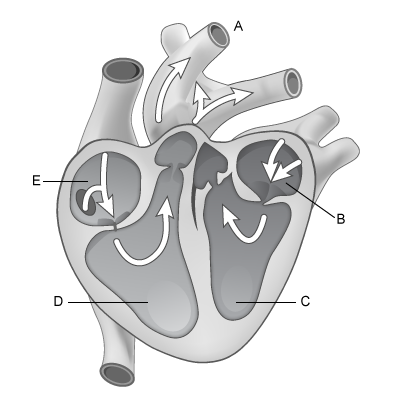 In the human heart, blood from the lungs enters the heart through the left atrium, pumps into the left ventricle, out the aorta and through the body, then returns into the right atrium, pumps into the right ventricle and exits to the lungs. Using the diagram, which set of letters correctly represents this process? The heart, veins, arteries, capillaries, and blood are parts of the system. Which are parts of the circulatory system?